Before we start working with Tee-Ballers we need to understand their perspective of the game. Batting, as far as their logic goes, is done with the arms. We face the challenge of helping them understand that their legs do most of the work when swinging the bat. On offense, when the ball is in play, the kids' experience is a mad dash of anxiety in hopes of getting to the next base safely. They are not particularly conscious of the times when they are going to get to the next base without a play being made on them. Some kids, because of the fact that when they are running between bases they are not 'safe', will be reluctant to leave a base even when play forces them to the next base, especially when it is clear they are vulnerable to being tagged out (or put out at the next base). The defensive side of the ball is where the majority of our teaching challenges lie. For our kids this game of tag is a little more complicated because throwing and catching that darn ball doesn't always work out real well. Then, to make matters worse, we add the concept of tagging a base as an option for getting a runner out. And we are trying to teach these concepts in an environment where simply being the one who comes up from the bottom of the pile with the ball is plenty to call it a successful day. Please do not view these statements as negatives. Accepting these points as the realities that they are, and being prepared to deal with them, will enable us to better enjoy the time we spend on the field with our kids. If, as a Tee-Ball coach, we go into the season thinking we are going to experience baseball we are setting ourselves up for a lot of frustration and disappointment. If we approach the season for what it is, spending time with our child and their friends, watching them run around, laugh while they work to develop skills to catch, throw and hit that little ball, then we can have a great time as coaches. As adults we are going to the park thinking ‘baseball’, while the kids are going to the park thinking ‘I get to see my friends and run around a lot’. We want to see the activity from a kid’s perspective and teach and manage them within their perspective and recognize that the activities at the park are not always going to look like baseball. However, given the information in this section, over time, we can be help our kids begin to learn the basics of baseball and develop some baseball skills. Scientific research has determined that the human brain, on average, does not develop the capability to coordinate both eyes in what is called ‘binocular vision’ until around age 7 or 8. Until both eyes learn to work together we humans lack a keen sense of depth perception, which plays a big role in catching a flying baseball. It is important recognize that, short of a few exceptions, the brains in kids this age have not developed to the point where they can catch a flying ball with much proficiency. Missing a thrown ball at this age has little to do with a lack of athletic talent. In addition to the lack of brain development needed to track and catch a flying ball; the fact is that most have very little experience or practice in this skill. As the spring progresses the kids hey will improve and they will begin to catch the ball more often. The most important that we go into our tenure as Tee-Ball coaches with an understanding of the developmental limitations of kids in this age group. We can give our kids a glove, a ball and a bat, take them to a ball field and talk about baseball until we are blue in the face, but this is no guarantee that our kids will be thinking baseball the whole time they are at the park. Other things they will find of interest include: other kids to poke, grab, talk to, and chase; bugs, dirt, birds, airplanes, fire trucks, etc. These all can and will trump baseball in importance at times during a practice or game. Adults who recognize these realities, accept them and work baseball in along the way will enjoy their time with the kids much more. Coaches who resist accepting the reality of the Tee-Ball world will experience high levels of frustration, bewilderment and blood pressure. The kids learn that their legs power their bodies; that moving their feet is the key to playing in the field and that controlling head movement is a big factor in successfully hitting and throwing a ball. They come to recognize that “Baseball is a Game of Movement”. On defense when they are not playing the ball they have to cover a base. They always move somewhere the moment the ball is put into play. They remain active and having fun at all times that they are on the field (especially during practices, which always conclude with them scrimmaging). We want them to leave the field each day having had a blast. And at the end of the season express a desire to play again next season. In the end, our primary purpose as Tee-Ball coaches is to help the kids develop a love of the game and create an environment that leads to them wanting to continue playing the game. We need to get the kids to stick around until age 8-9. At that time the game begins to resemble something like ‘baseball’. Kids who make it to this age are likely to continue on with the game to age 12 ...and hopefully beyond. The first statement we want to make to Tee-Ball kids (not to mention most other kids age 12 and under) is, “You don’t swing the bat with your arms”. Why?” …because you don’t. Nearly 100% of kids think (and many adults too) that the arms power the movement of the bat. The fact is, the majority of the effort in moving the bat comes from the legs. Watch the baseball highlights on TV tonight. Only look at the batters from the waist down …you’ll see that there is a lot happening there. The first and most basic teaching point to convey to a young batter is that “Your legs swing the bat”. We teach them to think of their legs as a spring. They want to turn their front knee back towards the ‘catcher’ a few inches (like they are compressing a spring) and then turn their legs and feet as fast as they can to start the swing. They “Turn back, then TURN FAST!” ...then they snap the bat with their wrists to finish the swing*. While turning their legs and feet fast, the second aspect of a successful swing is to “Keep Your Head in Place”. When watching the batters on the TV baseball highlights tonight notice that when they are in their stance their head is centered between their feet and at the completion of the swing their head is still centered between their feet. Note: the phrase ‘keep your eye on the ball’ is incomplete; we must also include (or replace with) the teaching phrase, “Keep Your Head in Place”. Watch their swings and note how much their heads move. Once they learn to “Keep Your Head in Place” it becomes difficult to swing poorly. Stance - A very important point, which will positively impact the distance a player can hit the ball, is where a batter stands child stands in relation to the Tee stem and the ball. A batter in baseball contacts a live pitch pretty much when the ball is even with their front foot. We want our little ball players’ front foot even with the tee stem and ball when they are in their stance. Also they need their feet to be wider than shoulder width apart. Finally, we should be able to draw a straight line from their back toe to their front toe to the pitching rubber. See the article 'Herding Cats' at the bottom of this page. 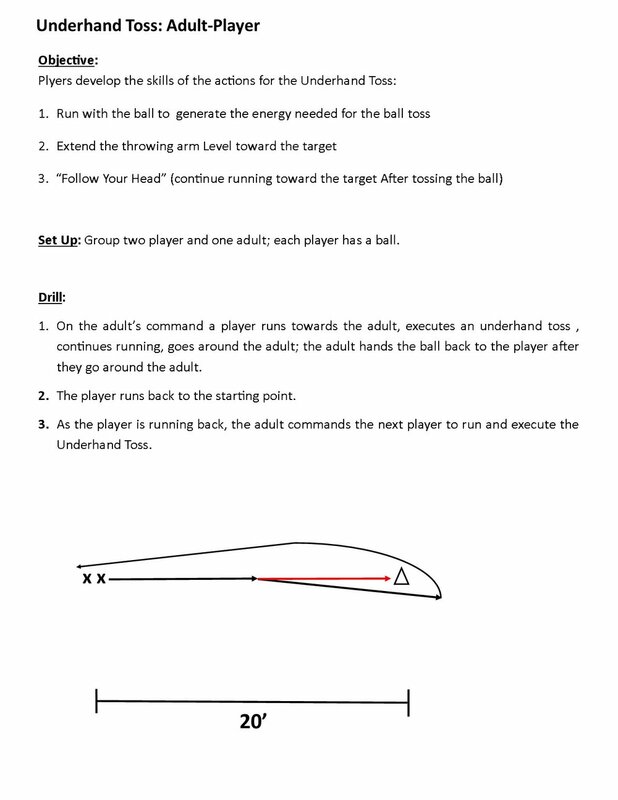 In the article you will find a diagram of the proper relationship of the players’ stance to the Tee. When working with kids on their fielding skills we want to be using the word ‘Feet’ and the phrases “Move Your Feet” and “Feet Wide” constantly, all day, every day, all season long. The cadence in fielding and throwing is ‘Fast, Slow, Fast’. We want the kids to run (move their feet) ‘Fast’ to the ball, ‘Slow’ down (and get their “Feet Wide”) to catch the ball, and then move their feet ‘Fast’ (shuffle) to throw the ball. Note: when delivering ground balls in practice, don’t use a bat; instead throw or roll the ball. It is difficult to consistently hit a baseball accurately and at the correct speed when using a bat. When throwing or rolling we can consistently place the ball where we want it and deliver it at an appropriate speed. This technique is used in college practices around the country and in pro training drills for the reasons mentioned above. If throwing/rolling a ground ball is appropriate at the college and pro level it surely is OK at the Tee-Ball level. We can make it through the entire Tee-Ball season and never hit a ball with a bat …and we will be hugely successful in getting kids the repetitions they need to develop their skills. As noted above, kids this age are going to struggle with catching a thrown ball …so how do we deal with this issue? First, when teaching and providing feedback we keep our remarks focused on the actions leading up to a catch. If we focus on the result we very rarely will have the opportunity to give the kids praise. When we focus on actions we can praise their efforts most every time. It is likely that a few of your kids will have ‘toy’ baseball gloves that are made of a ‘plastic’ type material and possibly have a picture of Spiderman on them. Their parents likely had the best of intentions when buying the glove and were not aware of the fact that some baseball gloves are not designed to really be used to play organized baseball on a team. It is tough to suggest a parent to go out and spend more money on a new glove. However, for the sake of the child it is something to consider discussing. There are a lot of good quality ‘leather’ gloves on the market for under $40 and many in the $20-$25 range. Here is a link < https://www.google.com/?gws_rd=ssl#q=youth+baseball+gloves+big+5&tbm=shop > showing some affordable gloves of pretty good quality. It is not suggested that gloves be purchased from this site; the link is shared to show pictures and brands of some gloves and to use as a reference prior to making a purchase. Most sporting goods store that cater primarily to teams sports (football, baseball, basketball, soccer, etc.) will have a supply of ‘real’ baseball gloves that are affordable. Purchasing a glove at Target, Toys R Us, etc. is not the best way to go. Any child on your team can perform these three fundamental skills every time, though they will not likely catch the ball very often. When they perform these actions in their attempt to catch, we can praise those actions and they will remain eager to keep trying ...and will progress faster in their skill development. Instruct players to stand with their feet wider than shoulder width and with their hands (and elbows) held out in front of their body. The ideal position of the hands is 3 o’clock and 9 o’clock with the palms facing in. This stance is difficult for a young child however, because of their lack of leg and shoulder strength. The interpretation of these instructions commonly result with their hands close together at the center of their chest with their elbows pointing straight out or with their elbows close to their body or their hands above their elbows like little football referees signaling ‘Touchdown’. Keep working with them to get in a proper position even though some many will not master it at this age. When we see them standing in the positions described, at least we know they are trying. A fun and effective way to train this concept is to tell the kids to pretend they are frogs. Tell them that when you call out "Ready Position" they jump up and land with their feet wide and hands and arms extended in front of them (in a Ready Position) and holler out loudly, 'Ribbit!". Doing this along with them makes it more fun and engaging. We want to remind our kids that the ball does not always come straight to them. They will need to “Move Their Feet” in order to take their hands to the ball to catch it. We “Move Our Feet to Catch”; we “Catch the Ball with Our Feet”. When a player (at any age) extends their arms and hands out in front of them; not necessarily ‘in front of their face’, but in front of the space occupied by their body. The result is they have both the ball and their glove in their line of sight. This positioning of the glove, within the player’s line of sight, and gives the brain a better chance of coordinating the glove with the ball. Most young children, because of the lack of shoulder strength to support the weight of their arms (and the glove), hold their glove (and elbows) close to their body when preparing for, and attempting to make, a catch. Important: We will often see the kids position their glove outside their shoulders when attempting to catch. They recognize they will often miss the ball and are smart enough to not stand directly in the flight of the ball. However, a child can still extend their glove out ‘in front’ of where their standing and not have their glove directly in front of them. Note 1: Given the fact that this age group has great difficulty catching the ball, a most efficient playing catch scenario involves each player with an adult (mom or dad) as their throwing partner. Yes, you read correctly; we should strive to have a 1:1 adult-player ratio at Tee-Ball practice. Parents, how long will our kids be this small and cute? We can make 60 minutes a day, a couple days a week, to spend time with our own child. It is important to understand that Little League International specifically states that any time player is throwing a ball that another player is to be catching the ball. The above suggestion is contrary to LL rules. The rule is well intended, but given that scientific research supports the idea that asking a 5-6 year old human to catch a flying baseball contrary to our knowledge of human brain development. An adult throwing partner can make more accurate throws increasing the chance to the player catching the ball. The adult will catch throws more often. In this scenario the kids get many more repetitions resulting in quicker skill development. If we find that each child does not have an adult to play catch with it is critical that we immediately establish this very important rule with the kids, “NO CHASING MISSED THROWS!! !” If we allow kids to chase missed throws our practices turn into kids chasing balls instead of developing skills. If we do not have extra adults available to back up the throws, place 3-4 balls a couple feet behind each player. When they miss a throw they can immediately pick up another ball and keep the skill building process going. Most Tee-Ball teams will have a player or two who, when attempting to catch a thrown ball, regardless of how high the throw is, will hold their glove with the palm facing up, as if they are balancing a tray of food or drinks. When a ball is being caught above chest level we want the kids to 'point their fingers up' so the palm of the glove is facing the ball. First, explain and demonstrate to the player that the glove hand fingers point UP on balls that are coming to them above chest level. Second, help them learn the proper muscle movements to get their hands/fingers in the proper position to receive a high throw. The drill is simple...face the player with both of you in a 'Ready Position' with the hands at 3 o'clock and 9 o'clock. Move your hands from the Ready Position to 12 o'clock, so your thumbs are touching and your fingers are pointing up. Have the player mirror that action, move your hands back to 3 o'clock and 9 o'clock, then repeat these actions,, with the player mimicking your movements, over and over 5-10 times. Throwing at this age is not going to look pretty early on for most kids. Not much at this age will look pretty :) but it's all cute and fun if we adults see the game of Tee-Ball from the proper perspective. Before teaching throwing we need to clarify a misconception that most every kid (and many adults too) has; they think the ball is thrown with their arm. We need to state emphatically to the kids, “You don’t throw the ball with your arm!” (This is done, initially, to get their attention and wake them up to the concept of utilizing their leg strength to power their throws. We come back and acknowledge that the arm IS part of the throw, but the use of the legs is a bigger part of the action being successful), you throw the ball by “Moving Your Feet”. First, explain to the kids that when they are preparing to throw they want the glove side of their body pointing at their target - NOT their chest. Next, they want to lift their elbows up to shoulder height and point their glove elbow at their target (or, if it’s easier, have them point their glove). They are now in a "Power Position". We instruct our players to 'Shuffle' towards their target (“Move Your Feet”) twice, with their head pointing at their target ('Your head is your steering wheel'). After two* shuffle steps they 'Pull' their glove elbow back and 'Snap' their throwing arm and hand down. * Many kids will shuffle more than twice; some will shuffle many times. Not to worry. Moving their feet to throw is a new concept and action; it will take them some time and repetition to coordinate the transition from the shuffle action to the upper body (arms) action. The teaching phrase we use is, “Shuffle, Shuffle, Pull, Snap”. It will take a couple days for the kids to do two things at once: shuffle their feet and throw the ball ('walking and chewing gum'), but they will get it and the result will be stronger and more accurate throws. (We will need to stretch out the distance between the kids playing catch with each other once they learn to move their feet, because the distance they are able to throw may double in a few days). Most players will struggle with using their glove elbow to pull back when throwing. First, it won’t compute that the arm with the glove helps the throwing motion. Second, it takes practice and coordination to execute this pulling action. Third it takes a fair amount of strength to use and control the action of the glove arm. Even with instruction many players will not learn to utilize their glove arm in the throwing action over the course of the season. We want to keep teaching it however, so that the concept is in their head and in subsequent years they’ll be better prepared to incorporate this into their throwing action. Some kids have a tendency to throw the ball in a high arc. This is a habit we want to nip in the bud right away and eliminate. A simple and fun approach to the kids playing catch, in order to break this habit, is to instruct them to throw the ball to their partner on a bounce (which may turn into several bounces). Kids on defense think if they are the first, second, or third baseman that that base is theirs. One of the first things they do when they go out to the field is stand on ‘their’ base. A quick way to educate the kids is to take them over to a base (third works well). We stand at the third baseman’s position (approximately 10’ away from the base). We tell them “I am the third baseman”, and then we point at the base and ask, “Who does that base belong to?” Their response will be “The third baseman’s!! !” (kids love to show us how much they know). Then we go stand on the base and ask them, “I am the third baseman. When I stand on the base, am I safe?” They will give you a silent and bewildered look. Then ask them again, “Who does the base belong too?” Hesitantly, and likely in a much softer voice, one or two will say, “The base belongs to the runner?” – BINGO! …the base belongs to the RUNNER, NOT the fielder. The ball rarely comes straight to us when we are at a base. And if the defensive player doesn’t have the ball they can’t get the base runner out. The defensive player’s sequence of actions is “Ball First, Base Second”. To solidify the rule that a defensive player must first have the ball in order to touch the base tell them that the ball is the ‘Key to the Base’. In order to touch the base they must first have the key. An important thing to note is that in youth baseball the base works like a magnet. Once the defensive player touches the base with their foot they have a hard time removing their foot from the base, even if a throw is off line. Keep in mind kids see older players (HS, college, and pros on TV) catching accurately thrown balls while having their foot on the base. What the kids don’t understand is that they are playing baseball on a completely different level…and the game of baseball is played completely different by little kids. Knowing the base is a magnet and that most throws will not be accurate, having the rule that the defensive player is not allowed to touch the base before they get the ball frees them from the powerful magnetic force of the base. We teach the players that they need to be in a “Ready Position” anytime they might be required to catch the ball (when standing at a base, when the batter is getting ready to hit the ball off the tee, when a ball is being hurled in from the outfield). Here in Seattle, the Seahawks are pretty popular, so I use the ‘Football Helmet’ analogy. I point out that Russell Wilson is Required to wear his football helmet on every play; it is not optional. Just like a football helmet is required on every play in football, a “Ready Position” is required every time the ball can be thrown or hit to a player. Kids recognize that the ball needs to get to the base before the runner in order to get the runner out. Understandably they are curious of where the runner is in relation to the base prior to them getting the ball. Unfortunately this curiosity often dominates their attention and they take their eyes off the ball. We want to constantly tell our kids to not look at the runner and keep their eyes on the ball. They need to catch the ball first if there is any chance of getting the runner out. They can’t catch the ball if they are not looking at it. After a few scrimmages we ask our kids, “Is the runner safe more often, or out?” The obvious answer is the runner is safe most of the time. We can now emphasize the fact that the runner is safe a lot, so getting an out on each play is not a big concern. We want to teach our kids to put all their attention on the ball and catch it first. With that accomplished they have a chance of getting an out. Another question is, “Can you catch the ball when looking at the runner?” This question helps them recognize that they need to keep their attention on the ball if they are going to have any chance to get the runner out. Finally, we must be patient with the reality of the distraction the runner poses. The issue will not go away during the course of the season; it will remain an issue until the players reach, at least, the age of 9 or 10. At the Tee-Ball level we begin the discussion and it will continue over the next few years. Safety (and fun) Point: When the kids tag a base we tell them to ‘stomp’ on the base. They think this is a lot of fun, but more importantly it has a safety component. A player cannot run and stomp the base at the same time. In order to stomp on the base they must slow down. Over the course of a Tee Ball season there are times when a defensive player who is 15’-20’ from a base with the ball in their hand will race the base runner to the bag. In most cases the kids are running perpendicular to each other with the result of the kids reaching the base at the same time, while running fast, and a potentially dangerous collision occurs. First Base - stand between the base and the ball; right next to the base (but not touching). Second and Third Bases - stand on the side of the base the ball is coming from; right next to the base (but not touching). Home Plate - stand on the pitcher’s side of the plate; right next to the plate (but not touching). These are the most basic teaching points for positioning at a base. As simple as they may seem, it will take the most of the season for most kids to get it; don’t be surprised if some still don’t. But just because they don’t get it exactly right doesn’t mean they are not benefitting. Much of the information we are giving them now will be incubating during the off-season and be ready to bloom when they get this information in the next season. These basics do not put them in the correct position in all situations. Following these simple rules will result, at times, with the infielder in the way of a runner rounding second or third base. However, these situations don’t come up often…and kids (base runners) are pretty alert to avoid collisions. …oh, you didn’t know that a player at a base doesn’t initially stand in a Stretch Position to take a throw?! I am not meaning to pop off to my readers. Actually I am chuckling a bit when I write this because many adults misunderstand how a player - including first basemen – stands at a base to get ready to take a throw. Next time you go to a pro game, or college (many HS first basemen have not been properly taught how to take a throw), when a ground ball is hit to an infielder, instead of following the ball, shift your eyes to the first baseman. A first baseman runs to the base and gets in a “Ready Position”! It is not until After the ball has been thrown and the first baseman sees that the throw is accurate that they Then move into a ‘stretch’ position to catch the ball. PLEASE, do not allow the kids to stand in a stretch position when taking a throw at a base, or when playing catch (many stand in this incorrect position when playing catch). You will be saving them, as well as their future coaches and teammates a lot of grief. Breaking older kids of this improper habit is very difficult. With that clarified we can move on to teach the kids where the defensive players’ positions are, and their basic defensive responsibilities. Note: Early in the season do not invest too much time and energy in teaching kids specifically where they need to stand at a base. Simply put, there are more important things for them to learn. Also, it takes more time and effort than we really want to invest to get the kids disciplined in standing correctly in relation to the base. This is another teaching point that we will address during the season, but not with high expectations for mastery. While some learning and application with take place, our fruits of our labors will pay off in subsequent seasons as the kids become more familiar with the game of baseball. Infielders - The first and third baseman stand 10’ from the base. Do not tell them a distance (they will start doing a heel to toe measurement from the base to their position), tell them to stand “Four Giant Steps” away from the base when the batter is getting ready to hit. Have the shortstop and second baseman stand half way between the corner base and second base. This is not 'regular' baseball positioning (remember: this is not regular baseball). The reason we position them exactly between the bases becomes clear when we start teaching ‘Infield Base Coverage Responsibilities’. The catcher’s Defensive position is just in Front of home plate; where they need to be standing in order to take a throw and make a play at home. Young kids’ idea of moving in the game of baseball is usually in relation to fielding the ball. When working with older kids a common coaching statement is ‘Know what you are going to do with the ball when it is hit to you’. While this is very important it doesn’t address the fact that the kids who don’t have the ball hit to them also have responsibilities on defense. And those responsibilities involve the need to move around the field. At the Tee Ball level our objective for the season is for the infielders to learn that when the ball is not hit to them they run and cover a base. The teaching phrase we will use over and over is, “Ball or Base” …if you don’t get the ball, you cover a base. And you run fast to the base to cover it! The first few days we work with the kids on this concept, they will struggle. However, after a while most will get the idea. While they will get the concept, it will take longer for them to execute it well. Expect it to take at least half the season before some of the kids are reacting properly when they are needed to cover a base. For most it will take till the entire season, but we will see progress being made along the way. As they progress in learning to move without the ball and cover a base it is very satisfying as a coach. And their coach the following season will benefit tremendously. Before we get into learning the drill regarding this fundamental baseball concept keep in mind that we will start working only with the four infielders. Initially we will leave the pitcher standing in the middle of the field with no instructions. Later, after the kids get some understanding of the concept of infielders covering bases we will then add the pitcher to the mix. In the next year or two, as coaches, we will come to learn that the pitcher has a lot of coverage (movement) responsibilities on defense. We will drill our kids in this concept, but time they will get the most opportunities to develop the habit of covering a base when they don’t get the ball is in our daily scrimmage. 1. If an infielder does not field the ball they cover a base (“Ball or Base”). 2. The third baseman and first baseman have one base. 3a. The shortstop and second baseman have two bases; one to their left and one to their right. 3b. If the ball goes to your left and you aren’t fielding it, run to the base on your left. If the ball goes to your right and you aren’t fielding it, run to the base on your right. It is understood that early in the year most of the kids on defense will want to attack the ball and will not recognize that some/many balls that are hit, are not 'theirs'. The 'positional movement' drills will start the kids on their way to recognizing that one infielder gets the ball and the other infielders cover a base. We teach kids their movement responsibilities through the 'Two Players, One Base' drill. The information below* is more for your information as an adult, than for teaching to the kids. Not until around age 9 are youth players able to comprehend and follow this instruction. At the Tee-Ball level, its best to let the child playing defense at the pitcher position to just hang out in the middle of the diamond. They will get plenty of balls to field. : ) As the season progresses, we will see many situations where the two infielders on one side of the field will be on the ground wrestling for the ball, leaving one of the corner bases (1st or 3rd) uncovered. We coaches may choose to point out that often a base is not covered and instruct the pitcher that, when they see this, they run over to the base and cover it. The reality is they will recognize this too late and not get to the base ahead of the runner. That sis OK though. They will begin to grasp the fact that there are times where they are needed to cover a base (not just stand in the middle of the infield watching). Simply the experience of recognizing this, followed by running over to the base will be a great education for them. Next year (or the year after), when they have matured more and are more in tune with what is going on around them, they will take these experiences and will be able to more quickly learn to execute the pitcher's defensive movement responsibilities at game speed. *The pitcher follows the same rules as the shortstop and second baseman. The base to the pitcher’s left is first base, the base to their right is third base. If the ball is hit to the pitcher’s left and they don’t field it, they run to the base on their left (first base) and cover it IF it is unoccupied; otherwise they stop short of the base^. The same rules apply for balls hit to the pitcher’s right. Ideally we only want the pitcher to go after balls they can field before it crosses the invisible line between them and first or third base. We don’t want them running back towards the infielders after the ball. This is much easier said than done, however. ^Possibly at the Coach/Machine Pitch level of play, and definitely at the Player Pitch levels, we train the pitcher, when the base is covered by a teammate we train the pitcher to continue running past the base, into foul territory, to back-up throws to the base. Why do we want the pitcher covering a base? Often both infielders on the side of the field the ball is hit to will go after the ball and neither will cover the corner base (first or third). The pitcher is the ‘insurance policy’ to be sure the base is covered. This does not mean we will not teach the idea, verbally, of the pitcher covering a base. We will point this out each time it comes up. The reality is that verbal instructions are not nearly as effective as the players drilling the actual actions. Later in the season, once the four infielders are demonstrating they are getting the concept of covering the correct base we can then start investing practice time on drilling the pitcher position. “Kids don’t sign up to practice baseball, they sign up to PLAY baseball” – we want to incorporate a 50/50 practice which ensures that practice will be FUN every day and the result will be the kids wanting to go back to the park to play again. To ensure the kids get to Play every day they come to the ball park we want to enlist a ‘50/50 Practice’. Half of practice time is drills and skill development and half of practice is playing the game. Playing a game (scrimmage) is fun - and it is what the kids expect when they signed up to Play. Base Running - this is a great group activity that also has an important socializing benefit. It is a fun way for kids to develop base running skills and become familiar with this fun aspect of the game. It also tires them out a bit, so they will pay attention to the instructions for the drills and skills segment of practice. Below are a few different base running activities. Only plan on each player having 2-3 repetitions in the warm-up base running activity each day. Over time they will develop their base running skills. When accounting for getting the kids organized before and after the warm-up, the actual activity only lasts about 3 minutes. Place a 2-3 kids at each base. Holler ‘go’ and the first player at each base runs. A second or two later yell for the next player to at each base to go, and so on. After they are all running, let them run around the bases 2-3 times. Save this activity for later in the season. Divide the players into two evenly matched groups; one at home, one at second base. In the relay race the players run all the way around the bases, returning to tag the next player on their relay race team. After tagging their teammate that runner sits down. Don’t be surprised if the kids want to ‘do it again!’. For this segment of practice we divide the team into groups; two groups if you have an appropriately sized team of seven players. If you have nine or more kids, make three groups. There are three drill stations: Playing Catch, Defense and Batting. Each group spends 7-8 minutes at a station, then rotates. If your team only has two groups, one station will not be used during each stage of the rotation. Under each station below is a list of activities. You’ll see that there are not many. These are very small children and there is a limit to how much they can learn in one season. The fact is, even at higher levels of play, practices are not real detailed (they just move faster). The key is for our kids to gain familiarity with the activities and get massive repetitions in order to gain some level of mastery of the skills. The drills are listed in sequence; those that are introduced first, down to those introduced later in the season. Each day, one to three activities are run at a given. As we progress through the season and down the list we don’t want to forget to come back and keep running, from time to time, the activities that were introduced early on. Note: At this age the kids do not need to ‘warm up their arms’ before participating in other activities. The group drills session at the start of practice will get them plenty ‘warm’. Point being is that a group of kids can go directly into the Batting or Defense station without playing catch first. Trying to coordinate 7, 8, 9 or more little ball players playing catch at the same time can become chaotic very quickly. Ideally we have two Tees available and use wiffle balls. We have two kids batting and 1-2 kids chasing the balls (they LOVE chasing the balls). When using wiffle balls two kids can hit at one time and nobody will get hurt if a flying wiffle ball hits them in the side of the head. When two kids hit at the same time, the players gets twice as many swings - more repetitions means greater skill development. Note: Make sure each batter has a helmet and the two tees are at least 15’ apart. We want to be conscious of keeping the batters’ heads safe. If you only have one tee, hard balls can be used. Give each batter 7-8 swings while the other players field the hit balls. Have one player ‘on deck’ who can jump right in when the previous batter finishes their swings. This will keep the activity moving and get the kids more practice. Later in the year, when the kids know the batting drills, we can go straight into the Tee work and have the on-deck batter do batting drills during the 60-90 seconds they are waiting. In this case we can increase the number of swings to 8-10 for each batter. Have an adult at the tee(s) with a bucket of balls who places the ball(s) on the tee. It is critical that the kids fielding the balls are paying attention when the next ball(s) is being hit. Finally, have a line that the players fielding are not allowed to cross. Often the batter(s) will not hit the ball far from the tee. We don’t want the players, who are fielding, running up close to the tee(s) to pick up a ball. This slows the activity down waiting for the fielding player(s) to run back to a safe distance from the batter(s). The line might be something already on the field, otherwise cones, hats, hoodies or some other objects can be used to indicate the line. For wiffle balls the line should be at least 20’ from the tee(s); if hard balls are being used the line should be at least 40’ from the tee. If a stronger batter is up, move the tee back creating a greater distance between the batter and fielders. Set up: Assuming a team with a roster of seven players; one batter, one base runner (a parent can serve as an additional base runner in order to give the defense more options for bases where they can get an out…make sure the parent runs at kid speed), four infielders and a player at the pitcher’s position. An adult plays the catcher position and also sets the ball on the tee for the batter. On each play we want to give feedback to as many players as possible. First and foremost we are constantly looking for actions the players do correctly or are making an effort to do what they are being taught. When we see these things we want to point them out. Nothing motivates a player more, to keep working to improve, than acknowledging that they did something correctly or that we saw their effort to do an action correctly. You reached forward; that helped you catch the ball. You moved your feet to throw; that made your throw strong and accurate. You really turned your legs fast on that swing; that made the ball go a long way. We want to shoot for a ratio of acknowledging things done correctly to making corrections of 3:1. If the kids hear us telling them they did something right more often than us correcting them they will learn to trust us and recognize that we are wanting them to get better. With that trust in place they will respond better when we are correcting them. They will be confident in us and know we are trying to help them. …Catching balls takes a little longer, (typically an additional 3-4 years), i.e., until 5-7 years of age. During infancy children can only catch large balls rolled directly at them. If a smaller ball is thrown directly at them they tend to close their eyes, turn their heads, and stiffly extend arms and legs. It is not until seven ot years of age that children develop the capacity to track flying objects, make appropriate leg and body adjustments, and prepare their arms, hands and fingers quickly enough to catch a three inch ball. The Science: Human beings' eyes work together as part of a process called 'Binocular Vision'. When the eyes work together the brain is able to process the information resulting in depth perception and the ability to track a moving object. In the human brain, this coordinating of the two eyes to work together and transmit information does not develop until ages 7 or 8. Line your kids up in a row (or two) and instruct them to stand with their feet wider than shoulder width and with their hands (and elbows) held out in front of their body. The ideal position of the hands is 3 o’clock and 9 o’clock with the palms facing in. This stance is difficult for a young child however, because of their lack of leg and shoulder strength. We remind our kids that the ball does not always come straight to them. They need to “Move Their Feet” in order to take their hands to the ball to catch it. We “Move Our Feet to Catch”; we “Catch the Ball with Our Feet". Next, we point out that by reaching forward with our hands, towards the ball, we can see the ball heading towards our glove making it easier to catch. We "Reach Forward to Catch". Line your kids up in a row (or two) and instruct then to get in a "Ready Position". Tell them that when you say "Move Your Feet to Catch" they are to move three feet to their left to catch and imaginary ball. Then you point to your right (their left) and holler "Move Your Feet to Catch". As you point and give the command, you quickly move three feet to your right (leading them in the movement), then holler "Reach Forward to Catch" and extend your hands and arms in front of you. Repeat by having them move to their right. Repeat back and forth 4-5 times (or more if you have time and they remain engaged...the more you repeat the actions the better trained in the action the kids become). On the coaches command a base runner runs through first base; continues running past the coach, giving the coach a High Five. Players learn, through doing, that they are allowed to run through first base and they will still be safe. Players learn to focus on the base, not what is happening with the ball. Rule: Look at the base while running towards it (not allowed to look at what is happening with the ball), see foot touch the base and yell, “Touch”. By having the players start 20’ from first base we get more repetitions in a shorter period of time. Three groups reduces the time the kids spend standing in line. In all throwing actions the legs initiate and provide most of the power. The throwing arm takes the power generated by the legs and conveys it to the ball. Young kids don’t understand this and won’t grasp it if we try to explain it beyond pointing out that the muscles in their legs are bigger. To some extent they will grasp the concept of the momentum created by using their legs to move them toward their target. The most important part of teaching this drill is to keep the initial instruction simple and to get on with running the drill.as Massive repetition of the actions is where most learning takes place (we are training the muscles). Subsequent instruction is primarily for the purpose of correction and keeping them on track towards executing the actions properly. Many kids will wait too long to toss the ball; they will get within about five feet of their partner before tossing. We continue to tell them, ‘Toss the ball when you are half way’. You might also place something (a bit beyond) the half way point that indicates the time to toss the ball. Early on some kids will struggle with the physical challenge of combining the two actions of running and tossing. These kids will run all the way to their targetand Hand the ball to you. Encourage these kids to toss the ball when they are half way between the starting point and the target, but don’t be overly concerned with coaching them more. Kids learn a lot form observing their peers. Once they see their peers tossing the ball before they get to their partner, they’ll begin tossing the ball. Same set up as 20’ Ground Balls, except we stretch the distance between the adult and the players...and, given the longer distance, the players shuffle and throw overhand (“Shuffle, Shuffle, Pull, Snap”). We still have the players, "Follow Your Head" (keep their momentum moving toward their target After throwing the ball) and then run around the adult they are working with. The four drills below are just a sample of variations of this same concept. Other than the '1-2 Play' at home, each drill could be run with the coach rolling to either player. There is a wide variety of drills that follow the same concept that our found on the Skill Building Warm-up page under the Defensive Responsibilities heading and the Pitchers Fielding heading. Also refer to the Defensive Responsibilities page where the complete (though brief) set defensive concepts are detailed. The drills and concepts are introduced at the Tee-Ball level, but our expectations for the kids' ability to consistently execute and full grasp the concepts must remain low. However, these actions represent how the game is played and it is important that they be exposed to these actions and drilled in them. Our primary objective is that they are introduced to the fact that on defense, all players must move once the ball is put into play and that each player has a specific responsibility. Their given responsibility comes down to one simple phrase, "Get the ball or cover a base. At the Tee-Ball level we will not address the pitcher's responsibilities. This are a bit to complex for this age of ballplayer. We begin addressing the movement and coverage responsibilities of the Pitcher at the Coach/Machine Pitch level. This same drill can be run with players reversing roles of who is fielding and who is covering the base. Players come to recognize that sometimes their job is to get the ball and other times it is to cover a base. Players develop the habit of always ‘moving’ when on defense as soon as the ball is put into play and to move quickly and with urgency. Players come to recognize that the momentum of running towards their target is what powers their throws. Their arm provides a minimal amount of the power behind the throw; the arm’s primary role is to guide the ball. They also need to learn to continue running towards the target during and following the throw which enhances the power behind the throw and improves accuracy. It will take quite a while to get the idea of momentum (generated by their legs) to compute in their minds. Given that the ball is held in the hand and he hand is connected to the arm, kids understandably see the arm as the power source for the underhand toss. Note 1: At the Tee Ball level we want to position the second baseman and shortstop halfway between the corner base and second base. These players are learning to understand that they could cover either base depending on if the ball is hit to their right or their left. By positioning them exactly between the two bases the kids establish a perspective that each base is of equal importance. Gaining an understanding that they have a responsibility for either base when playing second base or shortstop will give them a foundation for grasping more teaching when they graduate to the Coach/Machine Pitch level of play. Keep in mind, they will not master their movements and coverage responsibilities as Tee-Ballers, but they’ll begin to show signs of some level of understanding. At this level we are exposing them to the concept of movement. They will seem perplexed at times and make mistakes, but these experiences will pay off over time. Also, getting them moving and giving each position a purpose on each play makes the game more interesting and fun, which will increase the probability that the kids will want to come back and play the following season …which is our primary goal as adults involved at the Tee-Ball level. Note 2: The drills at the third base bag and home plate are less about preparing the kids for recording an out in a game and more about them learning about coordinating movements of two adjacent players, recognizing that sometimes a player gets the ball and sometimes gets a base. Most importantly they are gaining an understanding that movement is required each time the ball is put into play. The drills establish the habit of moving each time the ball is put into play. 1. Kids usually want to 'line up' within a few inches of each other*. Shortstop Position: Place two cones at shortstop, one for the player who will be fielding the next ground ball and the other cone 5'-10' away for the next player. Second Base Position: we instruct the extra player to stand behind the assisting adult, while the player participating in the drill is positioned next to the base. After the player participating in the drill moves away from the base, the coach/adult tells the next player to get into position next to the base. Players positioned next to the coach at the pitching rubber: just before the coach rolls the ground ball to the shortstop, the coach instructs one of the players standing next to them to rotate to the 'waiting cone' at shortstop. 3. The kids throwing the ball from second base to first base, the first couple of days the drill is run, misunderstand that their throw is supposed to be overhand; they will run to first and make and underhand toss. Simply continue to remind them that this LONG throw is overhand. After running this drill at a couple of practices this will not be much of an issue. If fewer than six kids participating in the drill: If five players: eliminate the extra player at second base. If four players: eliminate the extra player next to the coach at the pitching rubber. The single player there waits to 'catch' the underhand toss from the player running around the coach/adult at first base. They drop the ball in the bucket, then runs to the 'waiting cone' at shortstop. (Note: if the tossed ball goes far past them we remind them of the RULE: 'players are not allowed to chase missed throw' and instruct them to let the ball go and rotate to the 'waiting cone' at shortstop. * The natural survival instinct in a child drives them to stick as close as possible to the kids ahead of them in line in order to reduce the possibility of someone else getting in line ahead of them (to be the next to get food, protection, etc.) In modern society this should not be a concern, but until kids mature their basic survival instincts dominate their behavior. Given an understanding of this and other reasons behind young children's behavior makes it easier for the coaches/adults working with them to not allow these behaviors cause frustration. They can then lead the kids with greater empathy and reduce their urge to fight behaviors that are difficult to change and/or use strategies to overcome these behaviors. Before each new player speaks, the coach goes around the circle and repeats the names of each player who has already spoken. Kids get comfortable with each other and get to tell others about the things they like. Explain which direction players run around the bases. Point out which base is 1st, 2nd, 3rd and home. "Feet Wide to Catch" . ....that's the extent of Teaching Points for the season....Seriously :) . STOMP! ...when it comes to tagging the base, we teach the kids to STOMP! on the base (definition of STOMP: one feet remains on the ground and the other foot stomps). This, as much as anything, is a safety thing. A player has to pretty much come to a stop in order to Stomp. There will be many times, over the course of the season, when a defensive player, who has the ball, will be racing toward the base to tag it....while the base runner is ALSO racing towards the base. Collisions occur and tears are shed.....and sometimes a Fear or Dislike for the game is imprinted in a child's mind. Teaching the kids to STOMP on the base to tag it requires that they slow down and Stop before tagging the base. This habit will greatly reduce collisions at bases.......aaaaaand Stomping in FUN!!!!! . Note: this last segment does not take 10 min...the additional time is allotted because the previous series of drills may go over, by a few minutes, the time scheduled. Use wiffle balls for batting and have three players batting at the same time. Position Tees approximately 20' apart, while also designating a line approximately 30' in front of the Tees behind which the player(s) chasing the balls are positioned. Make it clear to all players that they are not allowed to enter the space between the batters and the 30' line (for safety). It is absolutely critical that, prior to each swing, a batter's feet are positioned in the proper relationship to the ball/tee stem. Have each batter work at their Tee for 90 seconds - 2 minutes, then rotate other players in to bat. Ideally each player gets 2-3 times batting (the amount of times batting is determined by the number of players and the number of Tees. Beginning with Practice #4, batting will be a 'station' in the Standard Practice rotation and there will only be 3-5 players in the batting group. * The batting tee is not used only in Tee Ball, it is a tool used throughout the playing career of a baseball player right on up through the Major League level. If you have any sense that your child will continue playing the game, give serious consideration of making the $25 investment in purchasing your own Tee. Ideally a Tee Ball team has three tees (one or two supplied by the League and 1-2 that are owned by team members), which allows three players to bat at the same time during practice. Adults throw to players, wide throws - players "Move Feet to Catch"
-------- we want to get through the above activities in 20 minutes...a few reps of each and keep moving on. *** Soooooo IMPORTANT: make sure that prior to each swing the batter’s feet are in a good relationship with the ball/tee stem. Proper alignment of the feet significantly impacts that batter’s ability to hit the ball well. This very well may be more important than the quality of the swing. Keep in mind that the batter’s success (or lack of success) is not just a concern for that individual child….the kids in the field and the kids waiting for their turn to bat are all impacted by the batter’s ability to get the ball into play. Hit off the Tee(s) ...introduce concept of "Feet in Place"
Hit off the Tee(s) ..."Feet in Place"
Process of learning, steps involved. Completing these four steps takes four practices for each given skill. Yes, it will take a month for any given skill to sink in and take hold, if we are able to cover that skill in each practice.